The overhauled CORREA FP60 milling machine was sold in December 2013, following a complete overhauling process carried out by our engineers at Nicolás Correa Service. This second-hand milling machine was totally refurbished, replacing all the parts of its power train and repairing the head. Likewise, all the spindles were checked and all the machine motors and drivers were replaced. Additionally, the electronic components were replaced and a new electric cabinet was installed, in addition to a new Heidenhain TNC-530 numerical control. Finally, a protective guard was mounted, to comply with the EC standards and regulations for milling machines. With this overhauling process, NC SERVICE has re-established the machine´s original performance, lengthening its useful life. Therefore, this bridge-type milling machine, with 5,000 mm of longitudinal travel and a distance between columns of 2,700 mm, is once again able to offer an excellent combination of rigidity and dynamic performance, as well as extraordinary reliability and robustness. The end customer for this milling machine operates in the Spanish aeronautics sector, machining aluminium alloy and composite parts. 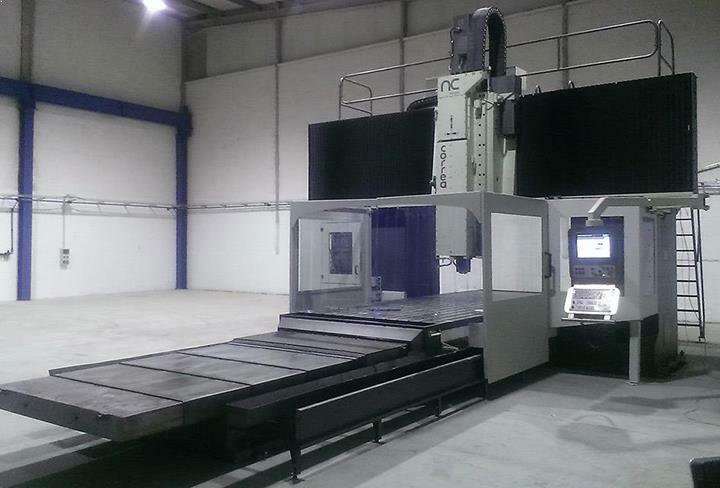 This machine is to be used for the manufacture of large-format parts, components and tools. Finally, between January and February 2014, the NC SERVICE engineers installed and commissioned this milling machine at the facilities of this aeronautical customer. We would highlight the complexity of the installation process for a milling machine of this size. The customer must be actively involved, as the first step is to make a foundation base at the site where the machine is to be finally installed and to operate.